Black Friday Sales on Chamonix Accommodation, Lift Passes, Ski Hire & Airport Transfers! It’s been snowing all week and our favourite playground is about to open – Compagnie du Mont Blanc has announced the partial opening of Les Grands Montets and Les Houches this weekend – so we’re celebrating with a Black Friday sale on Chamonix ski holidays! Our partners at Mountain Base are offering a generous 10% discount on all accommodation booked for any dates in January – just use the code MLJAN10 and save some money to spend on ski holiday essentials like fondue, new beanie, selfie-stick, or whatever your heart desires. They have a great range of apartments and chalets to suit all needs and budgets, so have a look and book yourself a bargain now. We work with a select group of ski and snowboard rental shops and they are offering great discounts of up to 50% when you book through Mountain Lifestyle. We’ve included Google Maps links to each shop so you can see which is closest to your accommodation, and some will even deliver to your door. If you’re visiting Chamonix between 9th January and 5th February, you can benefit from a hearty discount on your Mont Blanc Unlimited lift pass. The early bird catches the worm though and you’ll have to be quick, as this offer can only be booked today! Place your order before 17:00 GMT (6pm French time) today to save a bundle on your lift pass. Travel in style with our partners at Haute Transfer from 3rd January to 5th February. So, pop a ski pass in your loved one’s Christmas stocking and shake off the New Year hangover with a January trip to the Alps. It may be the coldest month of the year but that bodes well for crisp pistes, dry powder snow and endless fresh tracks – you can always warm up with a vin chaud and the heart-warming glow you get from having saved a load of cash! If that doesn’t get you excited then have a look at our Chamonix webcams page to check out views like this one taken yesterday afternoon! Fresh snow at La Flegere yesterday afternoon! 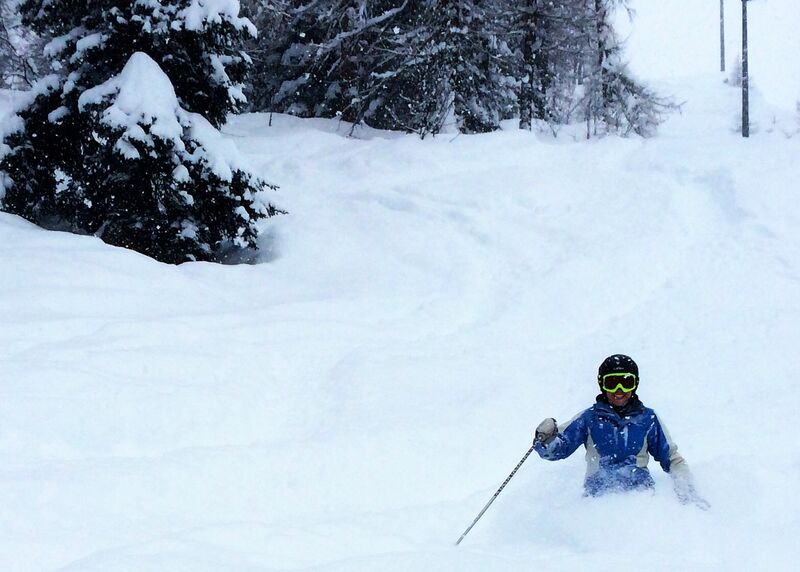 Last Chance to Save Big on Chamonix Lift Passes! We have two fantastic pieces of news for you: not only can we save you 25% on your Mont Blanc Unlimited Early Bird lift pass this week, but it’s snowing in Chamonix!!! The early bird deal is an exclusive discount that is not available on line, it can only be booked directly through Mountain Lifestyle and is only on offer for one more week – so don’t miss out. It even applies to children, senior and family passes from 2 to 21 days – a family of 2 adults and up to 5 children will save over 200€ on a 6 day lift pass! 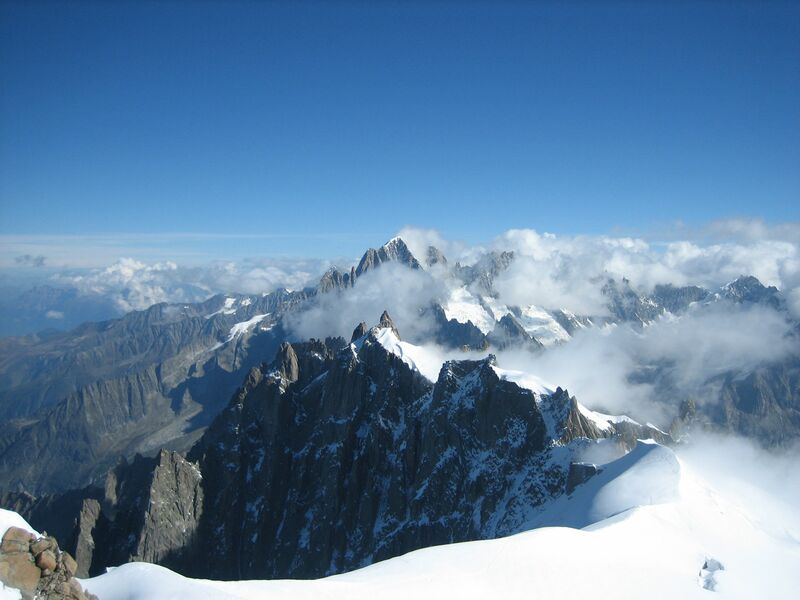 The Mont Blanc Unlimited is more than just a lift pass – as well as giving access to all of the Chamonix valley ski areas it is also your ticket to the peak of the famous Aiguille du Midi at 3842m and to France’s longest glacier at the Mer de Glace. You can also take a trip on the Tramway du Mont Blanc, a historic tram ride from the spa town of Saint Gervais up to a high mountain pass with stunning views. For those days when you want a break from skiing you can also use your Mont Blanc Multipass to gain free entry to the sports centre, swimming complex and ice rink in the centre of Chamonix as well as local museums. It’s perfect for exploring everything that Chamonix has to offer. 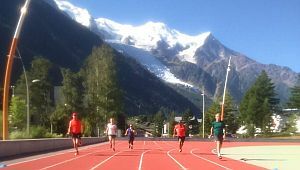 The Mont Blanc Unlimited Early Bird Offer is only available until 27th November, so don’t delay! Book yours now and save big on your Chamonix lift pass this winter! Mont Blanc Unlimited Early Bird Offer – Book Now! After one of the driest summers and warmest autumns on record, Chamonix is looking forward to an epic winter. According to the long-range weather forecast, all the precipitation that has been holding back for the past few months is forecast to fall during December and continue throughout the season. With plenty of precipitation comes plenty of… POWDER!!! So here are our best tips for making the most of all that lovely white stuff this winter. Get in there early and nail those powder turns right at the start of the season. This pre-Christmas off-piste course will not only show you the best untracked snow but will also give you a great start to the season. 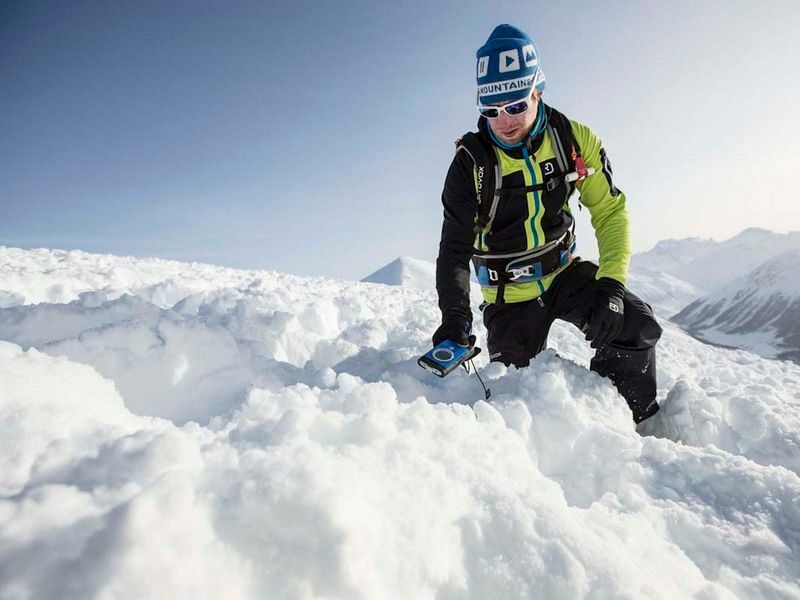 The 5 day course will teach you everything you need to ski all types of off-piste terrain, including essential avalanche awareness and crevasse rescue skills. Taught by qualified mountain guides and ski instructors, you will learn various techniques to improve your control and performance both on and off-piste; video analysis will help you pin-point whatever you need to focus on to become a much better skier. The course only accepts a maximum of 6 people, to ensure the best results, so book now as places are strictly limited! Looking to find the best powder, the gnarliest descents, the most remote slopes or the best mountain restaurants? A private mountain guide will ensure that you have an experience that goes way beyond waiting in lift queues and dodging snakes of snowploughing 5 year olds this winter. No matter what your ski or snowboard experience, your guide will tailor your day to suit you and to exceed your expectations. 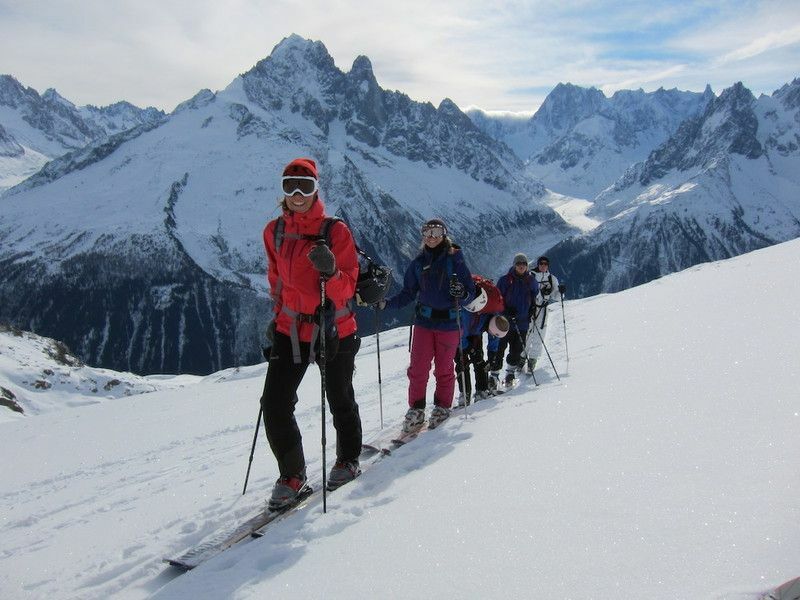 All of our guides are fully UIAGM qualified and know the Chamonix valley like the back of their ski mittens; from classic descents such as the Vallée Blanche to ski safaris and secret powder fields, let them take you on an unforgettable journey into the Chamonix mountains. New to ski touring or an experienced backcountry adventurer? The Mont Blanc mountains are some of the best in the world for exploring away from the lift systems and groomed pistes. Complete beginners can get to grips with the basics on our one day introductory course; there are plenty of gentle ski tours that are easily accessible from the Chamonix ski areas. Lead by a professional mountain guide, you’ll learn how to use crampons and perform kick-turns to trek deeper into the alpine wilderness. If you want to take your ski touring to the next level we also offer 2 day and 5 day courses, where you will venture further afield and see even more of the incredible Chamonix backcountry. Nothing could be more important than playing safe when you’re in the mountains. Exploring off-piste and skiing fresh powder is amazing but knowing about avalanches, glaciers and crevasses could save your life – or enable you to save someone else’s life. We offer a choice of mountain safety courses from 4 hour basic training to 4 day advanced search and rescue skills. Prices start from just 69€ per person – it could be the best investment you’ve ever made. The nights are drawing in, the temperature is dropping and it’s less than a month until the lifts open and the Chamonix ski season is under way! Most people ponder toning up and getting fit before a beach holiday but how many get in shape before a ski holiday? Yes, those thick trousers and padded jackets can hide a multitude of sins but building up your fitness can make a world of difference to your performance on the slopes. So… what exercises should you do to get your ski legs ready? Our friends at Clinique du Sport have developed a fantastic app that guides you through ski-specific exercises that will not only have you hammering the slopes like Tomba La Bomba but will also protect you from injuries that could hinder your apres-ski dance moves. If you not only want to ski like Lindsey Vonn but also long to have her physique then join in one of the many fitness classes that are run weekly in Chamonix by our friends at Progression Fit and Cham Training. Kettlercise, cross training, pilates and personal fitness sessions will have you toning up muscles you didn’t even know you had. Skiing and snowboarding can take their toll on your body, leaving you with all sorts of aches and niggles. 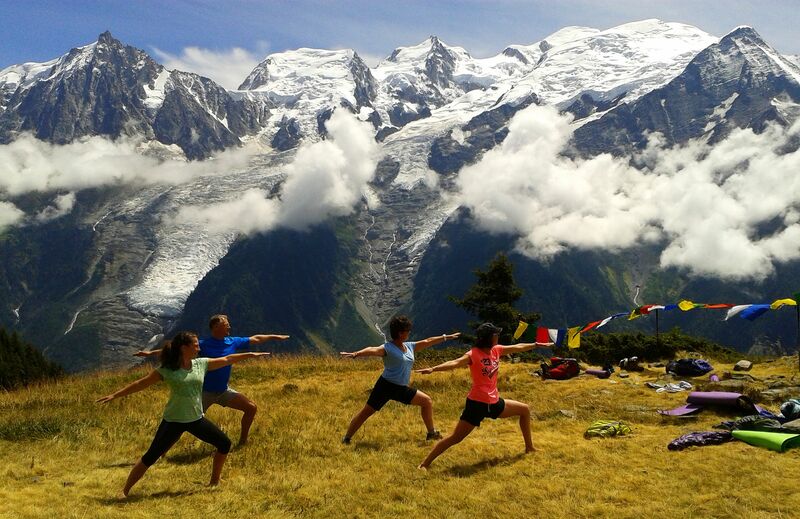 Soothe sore muscles and release tension with a restorative yoga class taught by Viva Yoga in Chamonix. Either join one of their group sessions to meet like-minded people, or book a personal session at an indoor or outdoor location of your choice. If all that action has left you feeling in need of a bit of TLC, book in for a soothing massage in the comfort of your own accommodation. Our partners at Revive offer all sorts of therapeutic treatments from a half hour Leg Blitz to a full body deep tissue massage. They’ll have you feeling brand new and ready to hit the slopes in no time.